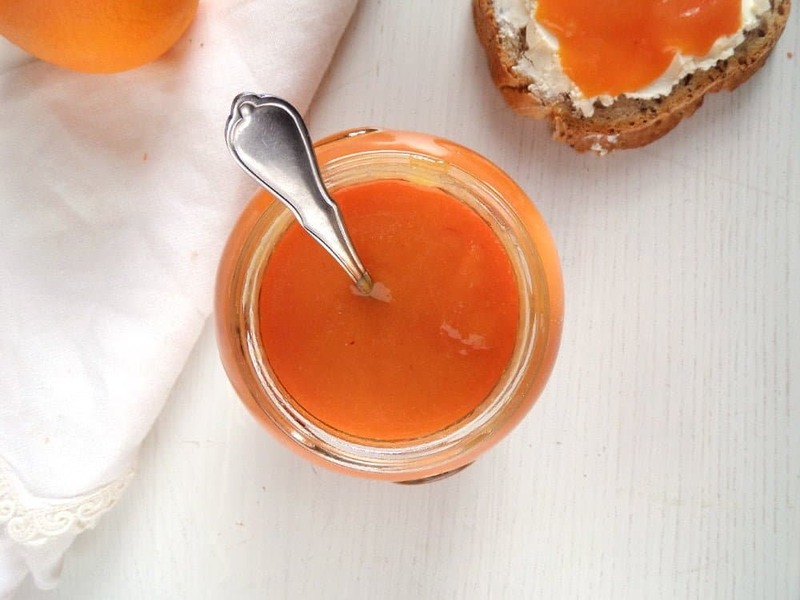 This is one of our favorite jams: blood orange jam, low in sugar, without pectin and incredibly aromatic. Oranges are my second theme this month, a fruit in season at the moment here. Over the next two weeks I will bring to you several recipes, six or seven, where the oranges take the lead part. I have already started on Monday but due to the fact that Monday was also a reveal day for the Secret Recipe Club, I spent more time speaking about SRC than about the oranges. Why I chose oranges? Well, apart from being in season right now, I do have a soft spot for them. They used to be my favorite fruit as a child, something really special, that I only got to eat at St Nicholas Day on the 6th of December or at Christmas. I mentioned before that I grew up in the communist Romania and shortly before the fall of communism food was in short supply there. We would buy our daily bread using a card, which stated that each person in the household is only allowed a certain amount of bread (about half a loaf if I remember correctly), meat was really something for special occasions and you could only buy oranges and bananas in December and only in very limited amounts. Same with chocolate and bananas. So oranges, bananas and chocolate became really St Nicholas/ Christmas presents for us kids and we were as happy to get them as my kids are happy today about their Lego Star Wars or Frozen dolls. During my childhood I used to totally hate chocolate (I know many shake their heads in disbelief right now, but it’s true), so oranges were the best thing for me in the present bag. Nowadays I could eat as many oranges as I like, every day of the year, but I don’t. I still like them but the fact that I can buy them any time, any place makes them less desirable, I’m afraid. Still when I do eat one it is always the same trip down the memory lane for me. The smell, the taste, the stickiness of the fingers… I am a child again! Blood oranges are something that I did not know as a child, but something I like very much today. The first and best I’ve ever eaten were two blood oranges I bought in an organic food store in Bath, England. They must have been a special sort, so red and juicy and good… I will never forget them, unfortunately I forgot their name. Since then I tend to buy blood oranges more often than regular oranges for plain eating, maybe in the hope of finding those special oranges again. 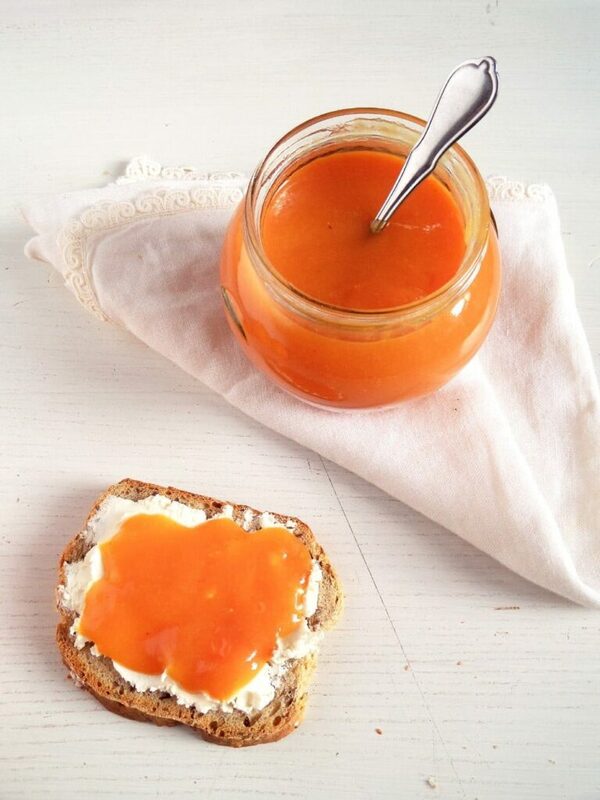 This blood orange jam recipe is a must for all orange/ orange jam lovers. I call it jam and not marmalade because I’ve read that a marmalade is a preserve made from the pulp and rind of citrus fruits while jam is made by cooking just the pulp. For this recipe I don’t use the rind, so it is a jam, even if it’s citrus. The inspiration for this recipe came from The View From Great Island, where Sue shared this wonderful Clementine Jam recipe. After making the clementine jam twice, I thought about using blood oranges instead. In choosing blood oranges I was hoping to get a more vivid color, it didn’t quite work, the jam is more orange than red but it is still beautiful to look at and so delicious, you will not believe it. This blood orange jam is my husband’s favorite jam at the moment, mine too actually. Sweet, yet slightly bitter, soft and somehow refreshing. You will love it, just give it a try, it is something so different from the everyday jam. Peel all the oranges. Remove as much of the white pit surrounding the oranges as you can. I try to completely remove the white pit from about half of the oranges using a small sharp knife and cutting away the pit around the orange revealing its segments partially. I leave most of the pit on the other half of the oranges. The pit is bitter, so if I leave the pit on all the oranges the blood orange jam might be too bitter. Removing the pit from half of the blood oranges balances the taste of the jam, making it slightly bitter (like any good orange jam or marmalade should be), yet not overwhelmingly so. I leave the white membranes from between the orange slices on. Make sure to remove all the seeds contained by the blood oranges. Give the prepared oranges to the food processor. Depending on the capacity of your food processor, you might have to process the blood oranges in batches. Pour the blood orange puree into a large pot. Add the sugar and the lemon juice. Bring everything to a boil and cook the blood orange jam for about 30 – 40 minutes or until the jam thickens slightly. As this blood orange jam recipe is not made using extra pectic the resulting jam will not be as stiff as you might be used to in a jam. However, this soft velvety consistency is part of what makes this orange jam special, so don’t worry, if you think that the jam is not as thick as you are used to, it is not supposed to be. Pectin is a fiber found in some sorts of fruits and vegetables, some have more and some have less. 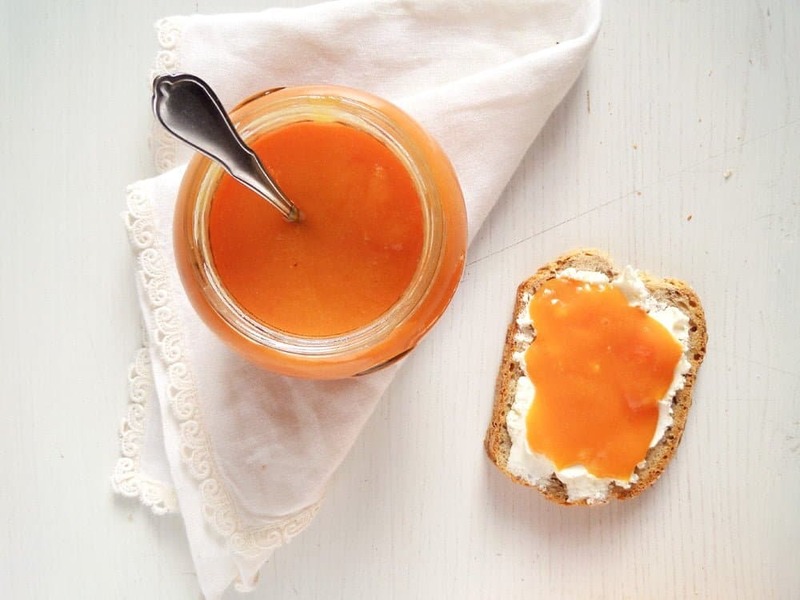 Citrus fruits and apples are particularly rich in pectin, so that is why you will not need the extra pectin when preparing this blood orange jam recipe. Adding the juice of two lemons and keeping parts of the white pit from the oranges, which contain more pectin than the pulp of the fruit, will ensure that the jam mixture will have enough pectin and that it will thicken. 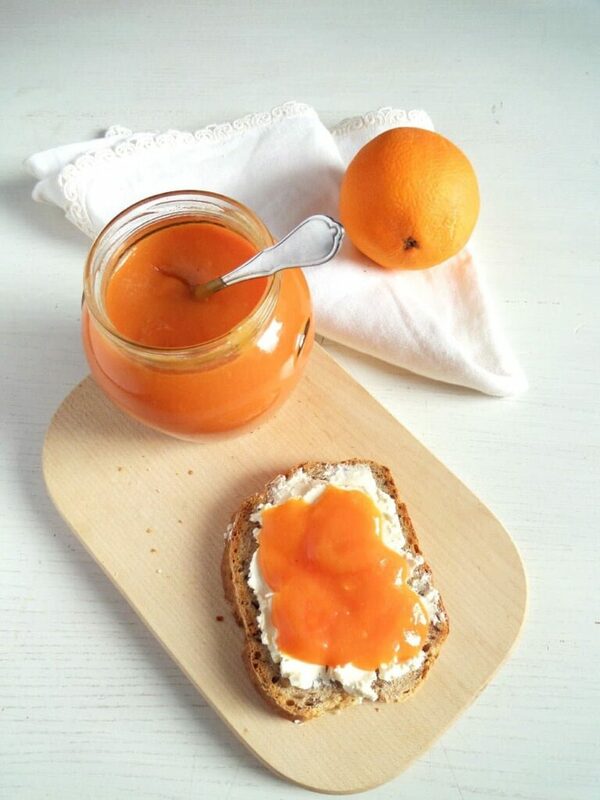 You can make this jam recipe using clementines/mandarins/tangerins or regular oranges. There is no need to remove any of the white pit when using clementines/mandarins/tangerins. Just peel the skin as you would normally do when eating a mandarin. I am very tempted of making this jam using grapefruit as well, I am curious how that would be. And the best part about this blood orange jam recipe, if you ask me, is that it doesn’t use as much sugar as a regular jam recipe would do. The lack of huge quantities of sugar does not affect the taste of the jam, the blood orange jam is just as sweet as it should be in my opinion, I love it this way. But you cannot keep a low sugar jam as long as you would keep a regular jam. This low sugar jam with blood oranges should be kept in the fridge and consumed as quickly as possible, that is within 10-14 days. The batch is not large, so eating this jam within the 2 weeks its doable. P.S. This is the jam I used to fill half of the Orange and Jam Swirl Cookies from Monday. Peel normally ½ of the blood oranges. Remove the peel of the other half of the oranges with a knife, removing the white pith as well. (I find it too bitter if I leave the white pith on all the oranges. This is not necessary when making the jam with clementines, they are not so bitter). Halve the oranges and carefully remove all the seeds. Process the oranges in the food processor until smooth. You might have to do that in batches. Pour this puree into a pot, add the sugar and the lemon juice and bring everything to a boil. Cook for about 30 – 40 minutes, uncovered, stirring regularly. Stop the cooking when then jam has thickened and reached the desired consistency. If not thick enough, you can cook it for a little bit longer. It will not jelly as much as a jam made with pectin, but it is OK so, I love the soft consistency. Pour the jam into clean jars, leave to cool and refrigerate. It will keep for about 10 – 14 days in the fridge. Your story sounds so familiar. Oranges were also not abundant when I was growing up. We got them in our stocking for St. Nicholas and were thrilled wit them. My kids would have never wanted oranges in their stockings. They could have them any time and they just weren’t special. I still love them and love the beautiful blood oranges even more. I know I’d love this delicious jam! It’s totally funny to think about the way my kids would react if they would only get oranges and chocolate for Christmas. They’ll probably get traumatized. 🙂 And the jam is really something for orange lovers, you will love it. I love your story about how special oranges were as a child. It is so easy to take things for granted when they are always available. I feel like blood oranges are more special, as they are usually only available for a short time once a year. This jam looks so beautiful and delicious! I definitely need to get my hands on some blood oranges and make this asap! I LOVE blood oranges and turning them into jam is genius! That color is so beautiful! I want to slather this stuff on all the things, including my fingers! 😉 Cheers, dear! Thanks, Cheyanne. Whenever I make a batch of this, we have nothing else for breakfast until everything’s gone. 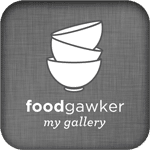 Had a salad with blood orange for the lunch today…now I wish I could have some of your jam for the breakfast tomorrow :-)) It looks great, Adina. This jam looks so delicious! I’ve tried my hand at marmalade once before and it was so much work that I’ve decided I won’t be going to that trouble for a long time. This recipe is so much simpler without all the nonsense with the peels. I hope they have blood oranges for sale at the store this week so I can make a batch! Oh… And I hope you find your perfect blood orange soon! 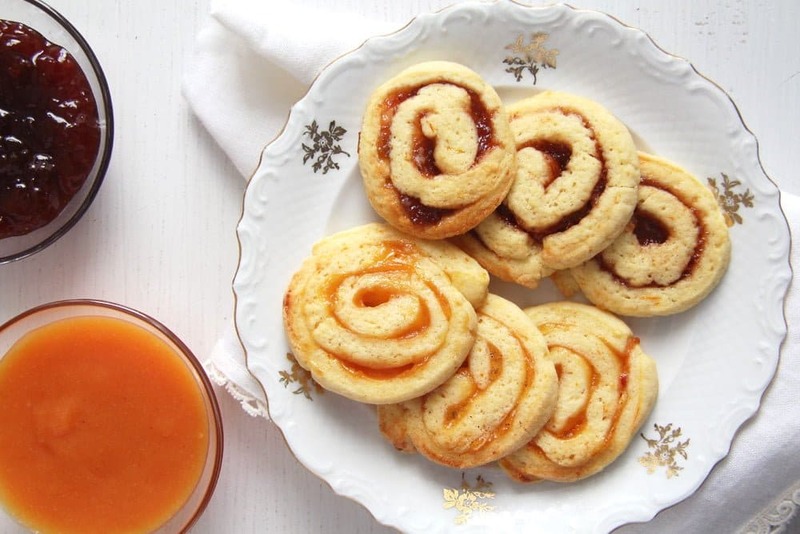 This is just gorgeous, I have a blood orange jam coming up on my blog, too! That color would cheer me up any day! I can appreciate your story—how those times of hardship managed to give you some cherished memories. I grew up in wartime Vietnam. My family went from wealthy to losing everything before I ever came around. I remember at the beginning of each school year, the school would give each child a cellophane wrapped package of school supplies…pencils, erasers, a ruler, and notebooks. We didn’t celebrate Christmas, but it was like Christmas and so exciting for us kids. The Blood Orange Jam is so smooth and gorgeous! I have never made my own jam before. I love how easy it is to make! Thank you for this comment, Thao. I am happy that my own kids never knew any hardship since the day that they are born, but looking back, it was not all that bad after all, one doesn’t miss things one doesn’t even know and I think that thought me to appreciate more what I have now and to have more understanding for people finding themselves in impossible situations at the moment. I am thinking now about the Syrian, Afghan and so on refugees coming to Europe and especially to Germany, people who lost everything they had and about those unfortunatelly too many locals, screaming against it and having no understanding whatsoever (not even the desire to know and understand). This is such a beautiful story about how special oranges were as a child. And this blood orange jam looks so slicky and smooth. Absolutely divine for sure. Can this be canned also? I think there is not enough sugar in it to make it keep longer. You can definitely freeze it though. Will this recipe preserve well if I heat process the jars? I’ve never tried that with this particular jam, Linda, it doesn’t contain much sugar so I cannot say how long it will keep if processed. You could try it and let me know. 🙂 This makes a rather small batch, if you would like to make more, you could also freeze it. So pretty Adina! I can’t wait for citrus season! Jackie, you cannot even imagine how exotic it sounds to me to have a blood orange tree in the garden. 🙂 I think you would like this jam, it is one of our favorites, although I never managed to make it red, the blood oranges we get to buy around here seem to have “bled” on the way, they are just as orange as the plain ones with some delicate tinges of red, which are not enough to make the jam red. The jam still tastes wonderful though. Do you remove the membrane on the orange segments or do you just throw it all into the food processor? Hi. Just the outer, thicker white pit, remove as much of it as you can, but don’t worry if it’s not perfect.